From it’s revolutionary beginnings to modern day, the American flag has stood witness to battles, triumphs and tragedies. The most famous American flags, or most iconic, may be from the image of soldiers at Iwo Jima or the photo of firefighters raising the flag at Ground Zero. 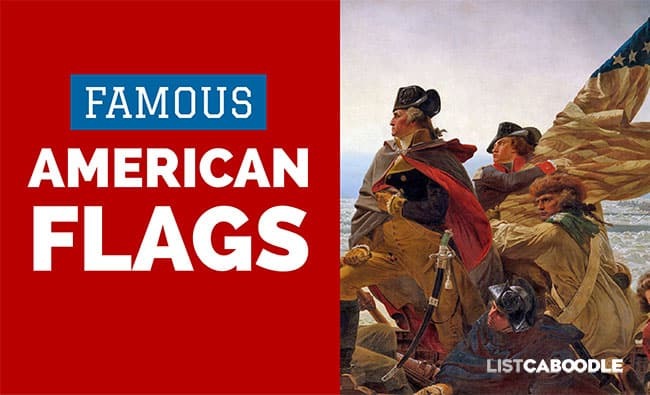 Here are 13 famous American flags that played an important role in the history of America. The stories they tell are the history of the American people. The first flag of the United States incorporated the British Union Jack along with thirteen red and white stripes to represent the newly formed Colonies. The flag was first flown over Prospect Hill in Cambridge, Massachusetts where George Washington’s Continental Army gathered to repulse the British Army, New Year’s Day 1776. The iconic image of George Washington boldly leading his troops across the roiling waters of the Delaware River during the Battle of Trenton was painted by Emanuel Gottlieb Leutze in 1851. The American flag is proudly held by future President James Monroe in the heroic depiction. However, we know this flag was not actually there. The Stars and Stripes flag did not yet exist on December 25, 1776, the night of the crossing. It would be created June 14, 1777 by Philadelphia seamstress Betsy Ross. “The Birth of Old Glory” by Percy Moran depicts Betsy Ross presenting the new flag to George Washington. After British troops sieged Boston in 1776 and the Revolutionary War took hold, it became clear to George Washington a new flag design was needed in order to sever ties with the British. Washington commissioned the seamstress Betsy Ross in Philadelpia to sew a new flag without the Union Jack. The Declaration of Independence would be read July 4, 1776, at Independence Hall in Philadelphia. The new Stars and Stripes flag was accepted by the Second Continental Congress June 14, 1777. The story of the Betsy Ross flag has been debated and discredited by some reasearchers and scholars. Not enough historical evidence exists to support or refute the validity of the narrative. The Bennington flag commemorative stamp. The Bennington flag is purported to be the oldest surviving Stars and Stripes flag. It currently resides at the Bennington Museum in Bennington, Vermont. The large Bennington flag may have been used by General John Stark during the Revolutionary War. But fiber analysis has shown it is more likely from the period associated with the War of 1812. The flag’s “76” commemorates the year of America’s independence and the seven-pointed stars may have origins in Masonic symbolism. The American flag has gradually changed over the years since its inception in 1777. Congress officially sanctioned design changes to the flag for each new state added to the Union. But the flag as we know it today has not changed since 1960. The “Star Spangled Banner” flag flew over Fort McHenry in 1812. After the War of 1812, a tattered American flag still flew over Fort McHenry in Baltimore Harbor. Francis Scott Key, moved by the resilient image, penned a poem that would become the The Star-Spangled Banner on September 14, 1814. The song became the official national anthem in 1931. The surviving flag at Fort Sumter National Monument. The Civil War began with the attack on Fort Sumter in Charleston harbor, South Carolina. The flag pole at the fort was toppled by Confederate forces during the bombardment. The American flag had 33 stars, arranged in a unique diamond pattern, representing each state in the Union. After the attack on Fort Sumter, President Lincoln considered removing 11 stars to reflect the seceded Confederate states. African Americans contributed greatly to the Union victory in the Civil War. The men of the 84th Infantry Regiment were known as the U.S. Colored Troops. The unit fought Civil War battles mainly in Louisiana along with other colored troop regiments and Union volunteers. The flag of the 84th Infantry Colored Troops is memorialized with each battle and date they had fought. It is held by The National Museum of American History. The locomotive that carried Lincoln’s body back to Springfield, IL. President Abraham Lincoln’s body was carried home by train after his assassination by John Wilkes Booth. The funeral train, which also carried the body of Lincoln’s son William who had died of typhoid early in 1862, was decorated with American flags and funerary bunting. Along the route back to Springfield, Illinois, memorial services were attended by an estimated 25 million Americans in ten cities. The train retraced the route Lincoln had taken to Washington as President-elect. Lincoln’s body was interred at the Lincoln Tomb at Oak Ridge Cemetery on May 3, 1865. One of the surviving flags from the funeral train is held by The National Museum of American History. Learn more: Lincoln’s last words. Teddy Roosevelt led his troops to victory at San Juan Hill. During the Spanish-American War, future U.S. President Teddy Roosevelt lead the first Volunteer Cavalry (called the Rough Riders) to victory on San Juan Hill in Cuba. The soon-to-be 26th President posed for a picture with his troops with the American flag after repulsing heavy artillery fire and helping to end the war. A portion of the original Rough Rider flag is held at the Gettysburg Museum of History, Gettysburg, PA. It was saved by troop trumpeter J. Kirk McCurdy, who narrowly escaped the battle alive with a bullet hole in his hat. The official colors used in the American flag—Old Glory Red, Old Glory Blue and white—are specified by the U.S. Army along with the Textile Color Card Association. These exact colors must be used to create an official and authentic American flag. The USS Arizona in Pearl Harbor. The USS Arizona was stationed in Pearl Harbor when Japanese pilots opened up a bombing campaign in 1941. The American battleship exploded and sank, killing 1,177 sailors and crew. The air attack took out 19 Navy ships, including the Arizona. An American flag survived the attack. It had flown on a boat parked on the Arizona’s deck. The fuel oil-spattered flag was saved from the wreckage and is now held by the Arizona State Capitol Museum. The USS Arizona Memorial in Honolulu, Hawaii is visited by over two milion people each year. During the battle of Iwo Jima in World War II, five Marines and one Navy corpsman gathered to raise a U.S. flag on Mount Suribachi in the western Pacific. Photographer Joe Rosenthal was there to capture the iconic moment on February 23, 1945. The resulting photograph became one of the most reproduced in history and would win Rosenthal the Pulitzer Prize. Each color in the American flag holds symbolic values: red symbolizes valor and hardiness; white symbolizes innocence and purity; blue symbolizes justice, vigilance and perserverance. America was attacked on it’s home soil on September 11, 2001. Three New York City firefighters defiantly raised an American flag above the wreckage of the 9/11 attack site as a beacon of hope. The flag has been displayed at the National September 11 Memorial and Museum located at ground zero. An iconic photo of the firefighters was taken by Thomas E. Franklin of New Jersey’s The Record newspaper. It has become as famous and recognizable as the image of soldiers raising the flag on Iwo Jima in World War II. Interested in learning more about flags? Vexillology is the scientific study and research of flags of all types, their forms, uses and functions. More interesting Caboodle? Check out these 13 weird wonders of nature.